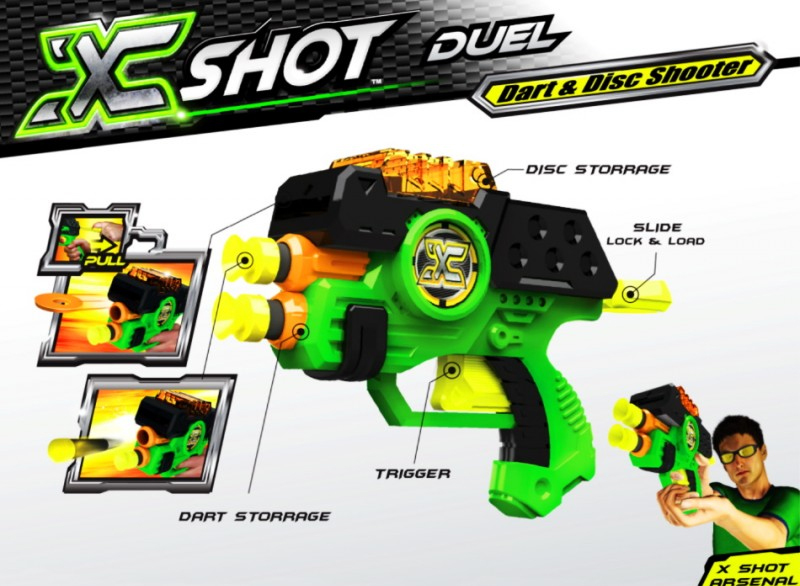 Six bullets and darts normal stream, in addition to a total of 12 bullets darts plus six bullets had painted up a gear as a bonus darts, darts has been sealed prior to use disk-shaped vortex! 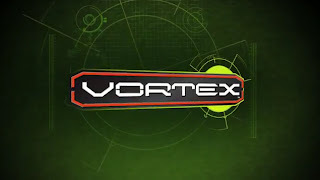 The new line, "Vortex" series was born! ! 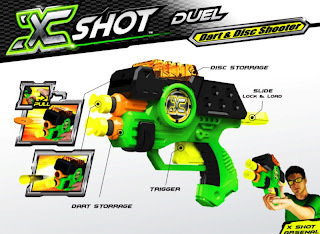 The disk-shaped darts, which significantly exceeds the distance achieved Rongudisukushutingu normal firing NERF! 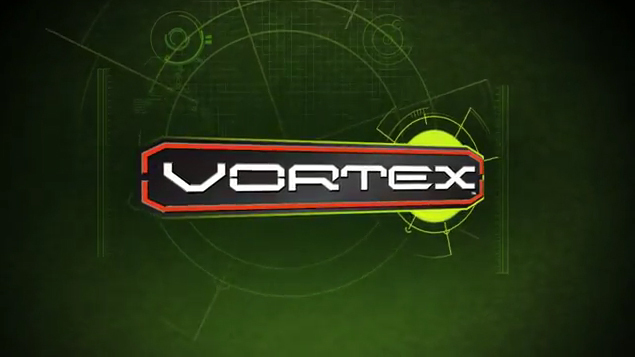 The new line, "Vortex" is Ridoaitemurasuta series. Disks can be loaded with five bullets. 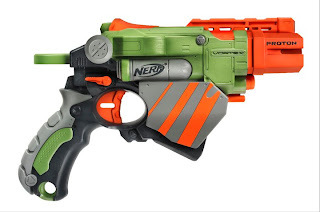 N-shooting can be enjoyed over the long strike. I love the Wild Planet Spy Gear line. It's so cheesy, but their stuff at least is innovative and different to most toy blaster lines out there and combines electronics for some pretty cool designs. 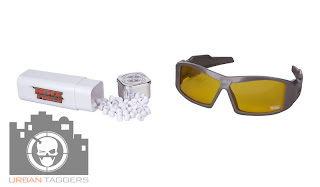 I'm not sure how practical any of this stuff would be in any real battles (why alert your enemies with an alarm to let them know you're ABOUT to shoot them when you've gone to the trouble of hiding and shooting remotely?! ), but I like 'em anyway. "Okay, overall build is pretty good, bipod a tad flimsy, Pump is the firing mechanism, pull back to prime, release to fire, MASSIVE spring, bolt action to load next shot. 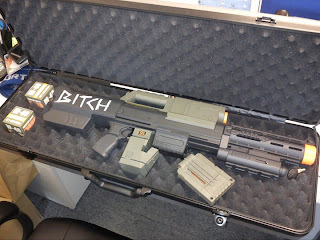 Overall a very impressive piece of kit, will get it out to do some firing tomorrow"
Update 1-6-11 Kyle tests the performance: "did a proper test fire of the Shadowhawk 100, range isn't an issue, the projectiles can definitely make the distance. 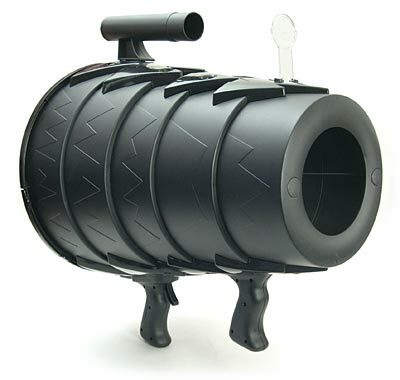 The issue is that it's susceptible to misfires and accuracy varies on whether or not the wad actually stays together or whether to force of the oversized plunger shreds it in the barrel. Will run more tests and keep you posted"
Update 3-6-11 Kyle's indepth tests: "Okay i finally did a more comprehensive shoot with the Max Force Shadowhawk 100, range is as they say, accuracy varies, don't try to use the sight but with a little practice hitting a man sized target is no problem, even at ranges far beyond the capacity of a nerf blaster. 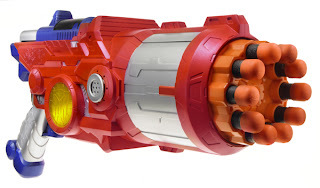 Jamming affects it if you don't fire correctly, or don't properly soak projectiles. 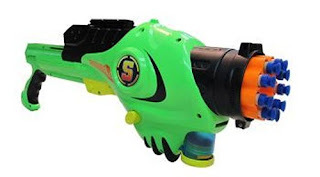 But as for the boast that they're harmless... i shot my friend in the bare stomach with this thing and it left a welt the size of a five cent coin for a few hours WEAR THE PROTECTIVE EYE GEAR"
Interesting to see how it fares. Thanks for the intel Kyle! 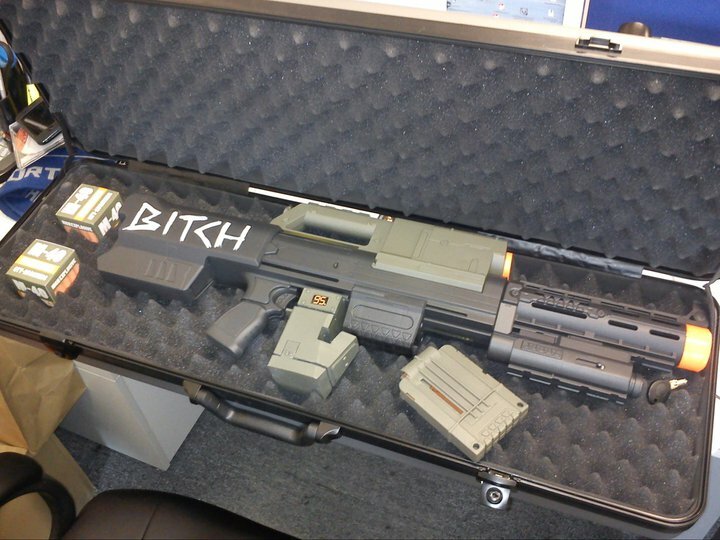 Aliens: Colonial Marines: Sega's "official" mod. This is the kind of marketing I LOVE. Reports on the Official Playstation Magazine -Australia's Facebook page have them receiving a very cool package from Sega, the distributors of the new Aliens: Colonial Marines due out later in the year. 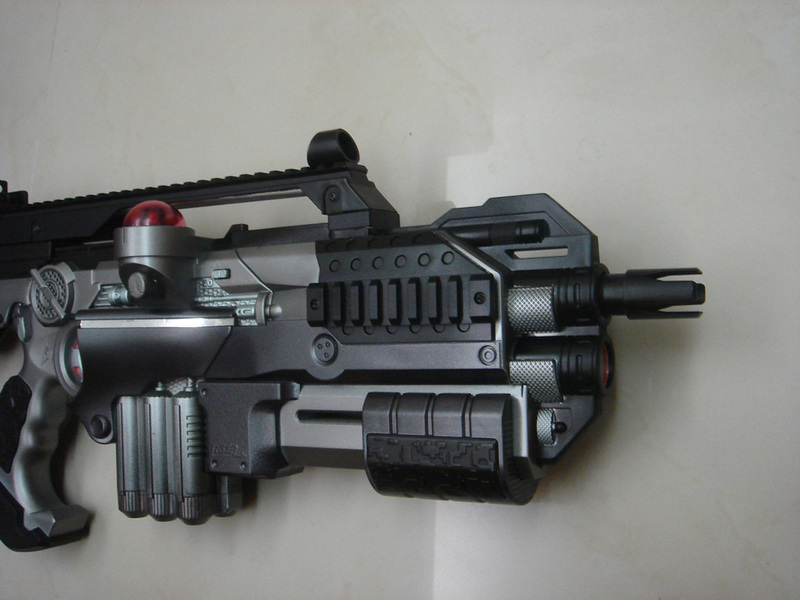 Given the last promo gift was Newt's doll (or what was left of it) 'Casey', this is much much cooler. 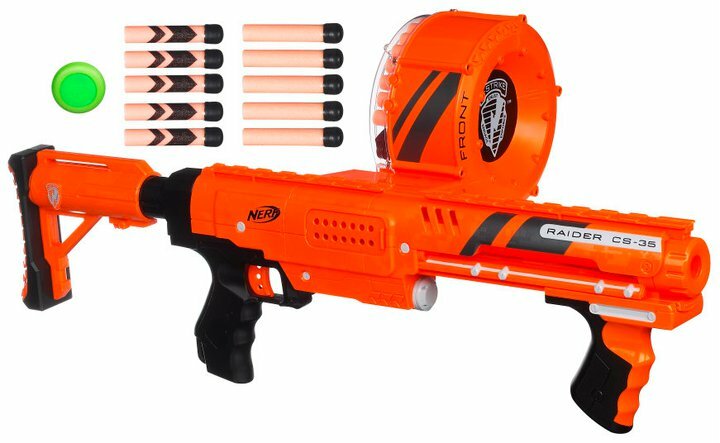 We've been getting word on the new Max Force range of blasters have made it to Australia early- original press releases said they'd be in the latter half of the year but it looks like they've made it to our shores much much sooner. 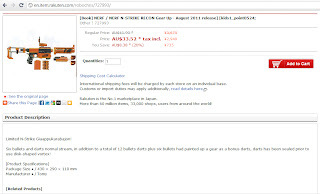 First word was that they were spotted in Tasmania; now our boys from the Canberra and Southern NSW Dart Tag crew have spotted the Blow Gun at Toyworld, Fyshwick in Canberra (my town!). 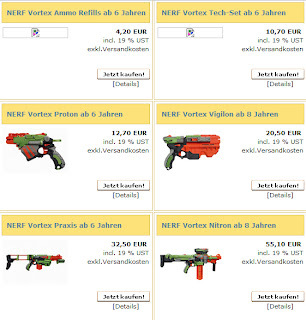 They're going for around 18bucks AUS (which is almost double the US prices!!). More information about US releases after the jump. 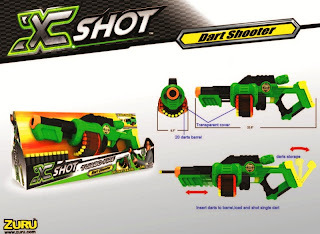 As we featured in a below post, Indigo Studios are Hasbro/Nerf's choice for package design. I had a look at their design portfolio online and I think I nearly pee'd myself in excitement; check these out! That being said, chances are these ARE just design concepts, but HO-LY crap this would be some exciting stuff if these made it into production. The Spectre looks amazing in Whiteout colours..
Sonic series is cool and all, but I have to admit that any blaster that's released in the new Whiteout series is going to be on my Santa list this year..
Update: Unfortunately, the portfolio has been taken down. I'm not sure why this has occurred, but it reiterates that it's most likely these images in their portfolio are just demonstrative of what they can do, rather than it actually making official release. Please don't hound them for info- they're designers, not manufacturers. Now here's something interesting. Indigo Studios are a design studio in Atlanta Georgia (My favourite town!) who appear to be responsible for designing the current packaging for Nerf. They've got a case study on the process on how they design the images for the boxes on their site. Please don't hound them for more product information; they're designers, not manufacturers. It's officially called the "Whiteout" series and has come without any official warning! You'll recall we got ourselves a white Maverick a few months back, lending itself to much speculation and discussion (and perhaps a bit of confusion too). A few pricelists popped up over time but not much else, so this would have to be the first time we've actually seen/heard of a real title for the line. And.. straight up they're available in Singapore, as posted by SG Nerf this morning. We were speculating what the forth blaster would be (We know the Maverick, Deploy and Nitefinder were on the pricelists) and it's confirmed it's the Longstrike CS-6 and it looks TRICK in this new colour scheme. 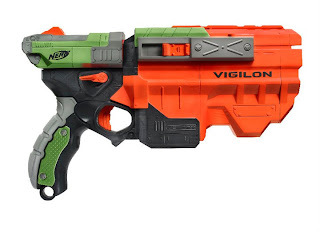 It's an interesting choice with the Longstrike, and many of the haters will roll their eyes at this (actually many of the haters will roll eyes at the idea of ANOTHER paint job anyway) but it really works. A selection of pics courtesy SGNerf is featured after the jump, but for the full kit and kaboodle, hit up his blog. 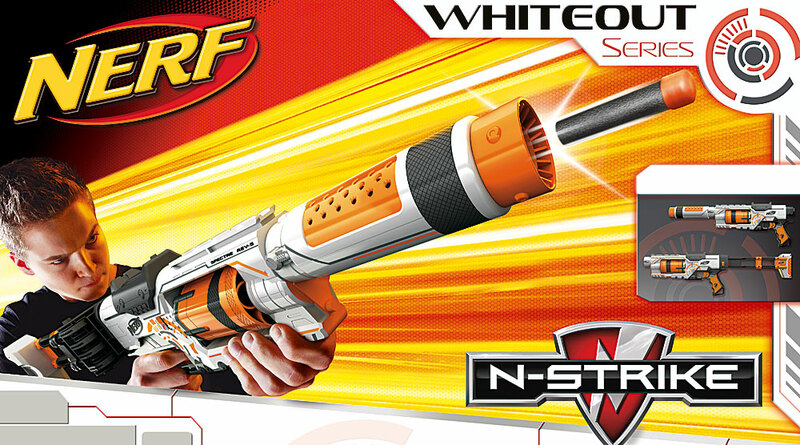 Note: Interestingly enough, despite this official release today there's no official mention of the Whiteout series anywhere on the Nerf site or Facebook page. 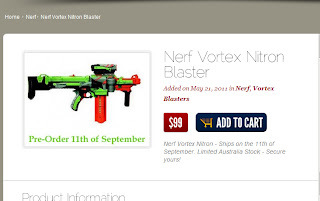 Any attempts to post images of the Whiteout blasters on their Facebook page have been removed?! Could it be another case of "if it ain't in the US it doesn't exist" mentality? 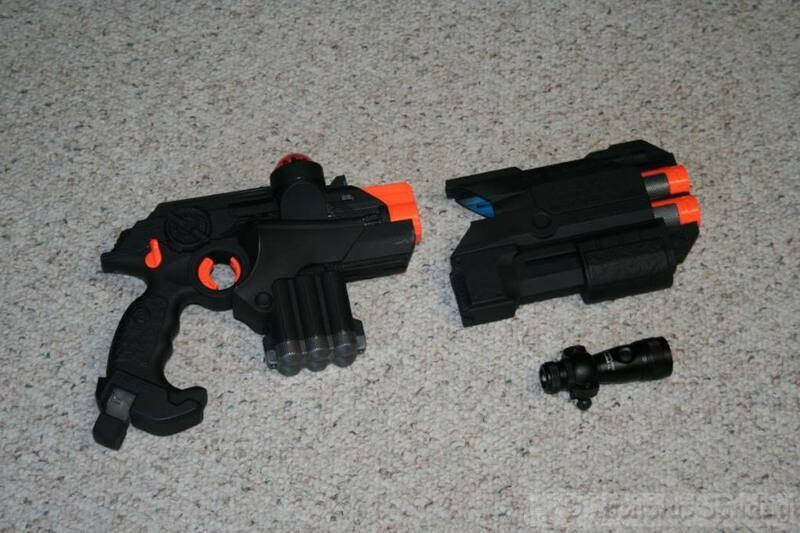 Green Lantern goodies- disc shooters and..fist. Sean Long vids crack me up- he doesn't take himself seriously and while does go on a bit, the reviews are pretty detailed and give you a good understanding of the toys. Replacement pellets seem to come in nifty white plastic cannisters . 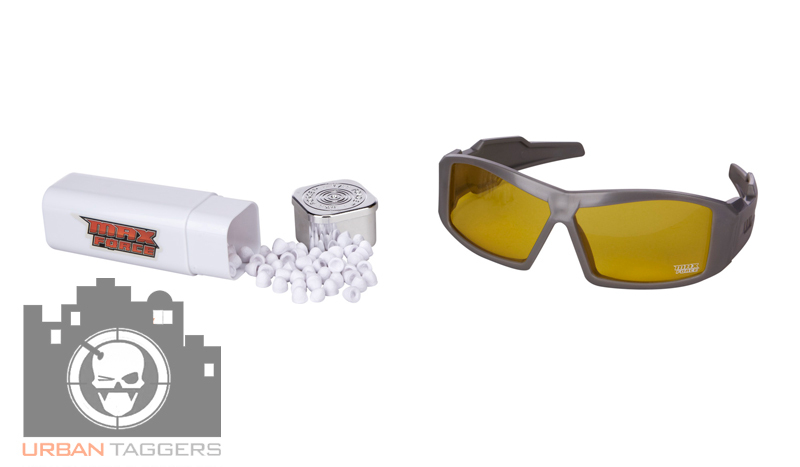 The protective eyewear looks like it's taking its cues from the popular Oakley Gascan styles. 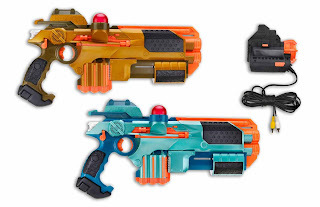 I have to admit, they may just be repaints of blasters I already own (and I have multiples of all of these..how many Maverick and Recon variants does one person need!).. but I'll be shellin' out the $$ AGAIN for them. They look TRICK. 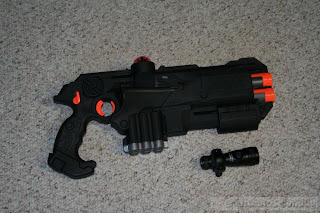 Rant: Blasters- What really MAKES it for you? Regardless of reports boasting some serious performances, the upcoming Vortex series from Nerf has many of the fans split on the new type of disc ammunition; it seems that we've all become so accustomed to foam darts that even Nerf can't make this alternative ammo seem appealing. Fans are always going on about distances; it's this pursuit that resulted in modders existing in the first place. Blasters like the Longstrike get absolutely slammed despite it being recognised as one of the best looking blasters Nerf have ever released mainly due to it's ordinary performance (and really, it's not even that bad) and people are always so caught up with how far things can shoot that they'll even go as far as building their own home made blasters. Ugly as sin, but damn they go far.. It's been demonstrated that distances can be achieved using alternative ammo- it's confirmed that X-ploderz blasters get some serious range compared to foam; Jakks Pacific's upcoming Max Force line is reported to hit 100feet ranges out of the box with glorified spitwads. 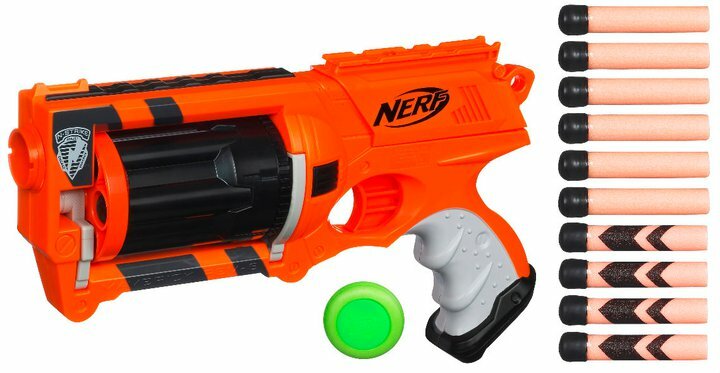 Nerf's Vortex is looking like it'll do similar distances with their new XLR discs. 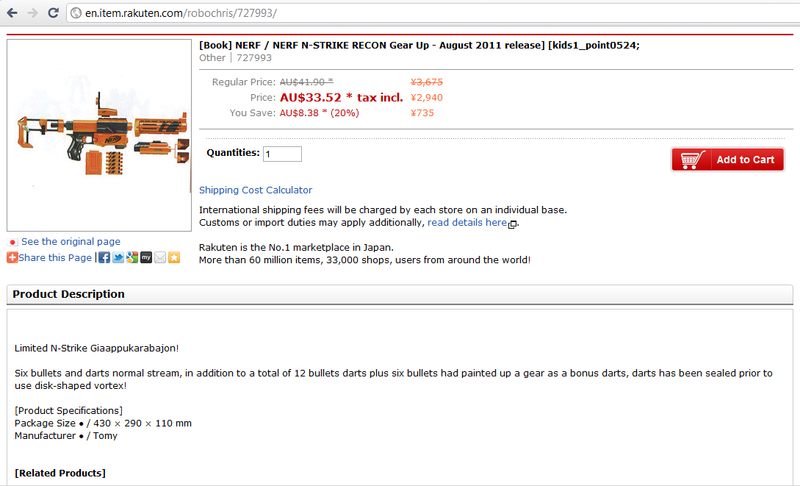 And yet the critics are still sceptical- mainly because of the fact it's not with foam darts. 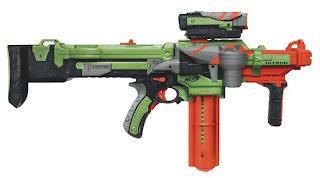 Whenever any new blaster comes out, the first thing everyone asks is "can it be modded to fire foam darts?" 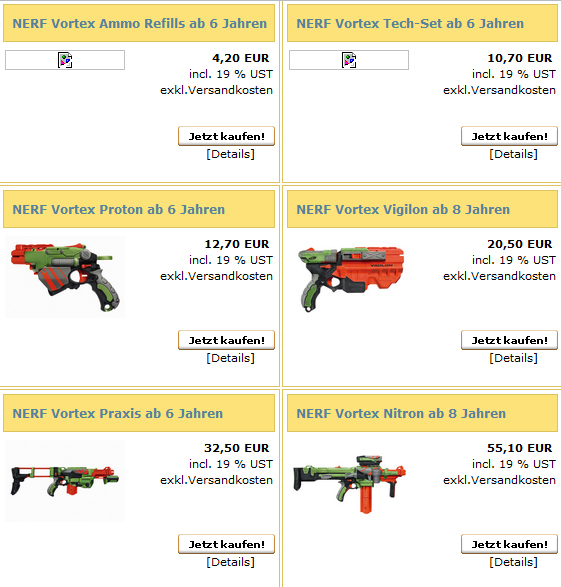 Interestingly enough, one of the biggest debates on Nerf is "Nerf vs Airsoft". 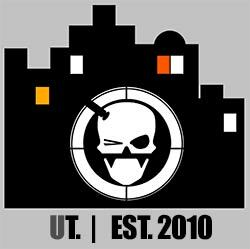 Airsoft doesn't shoot foam darts either, and yet we entertain the notion of Airsoft being something that deserves consideration as a 'rival'. What's even more puzzling is the concept of stefans and other r+d put into creating better darts with more weight and more robust foam than the traditional stock variety. We're no longer comparing apples with apples now are we? I'm interested in hearing your views, fellow taggers. What's really the clincher for you? 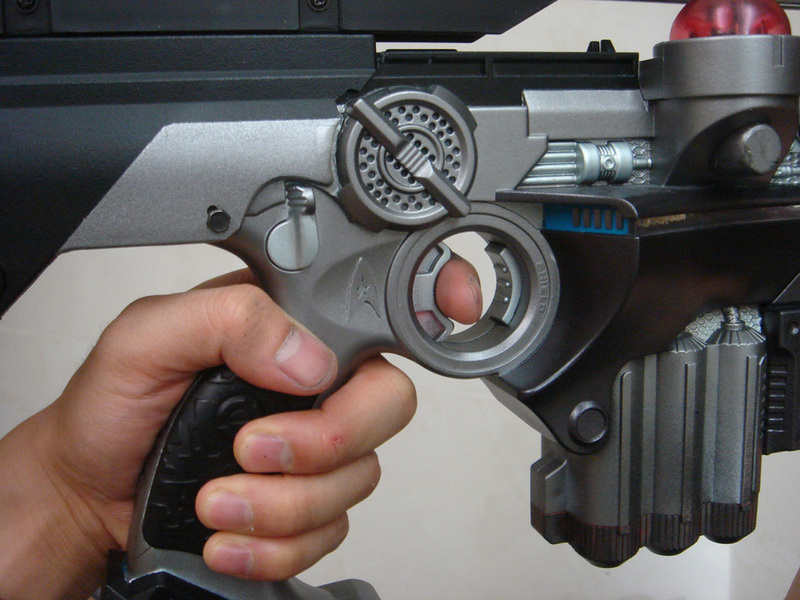 What's important to you when purchasing a blaster? And what is it about those lil' tubes of foam that excite us so much? 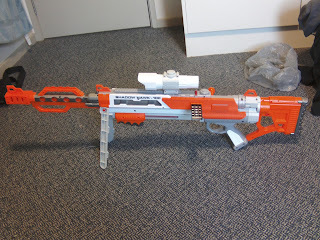 It takes batteries which I originally guessed was for light and sound because it looks like it has a manual primer on the top of the blaster; it does seem to state in the product descriptions it's automatic...more after the jump. 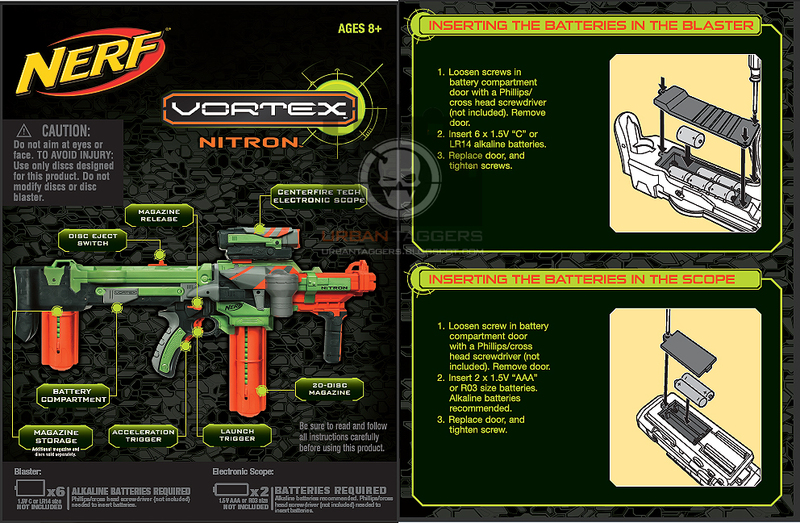 Our pal Neil from the Canberra & Southern NSW Dart Tag crew have given us the heads up that Australian e-tailer, the "General's Toyporium" have listed preorder prices for the new Vortex blasters to be released in September, 2011. 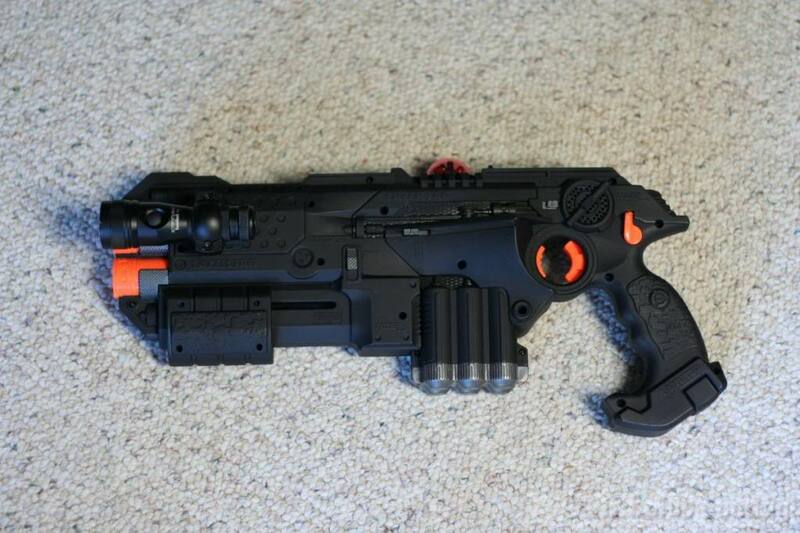 Our man Bazookafied has been working on a sweeeet project fitting a Phoenix LTX Lazertag blaster into Stampede ECS. He's almost there.. but alas not quite.I have utmost faith it'll happen.. it as to.. look at how maad it looks! 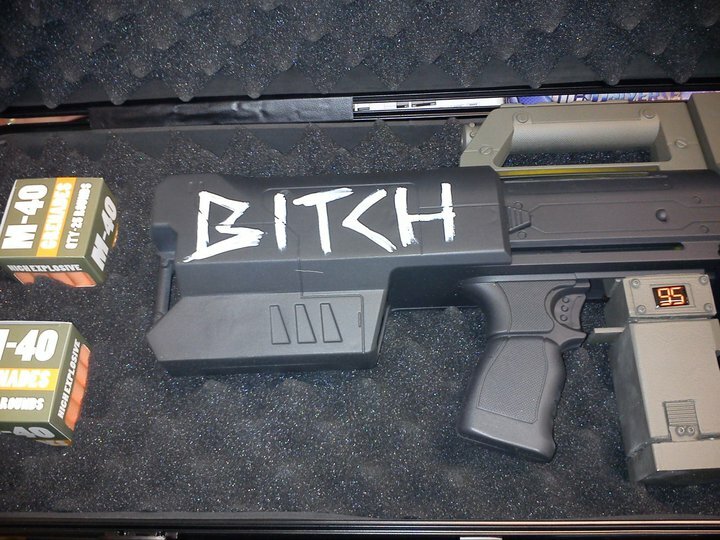 Courtesy of Laser Tag Taiwan, check out this maaaaad Phoenix LTX mod. 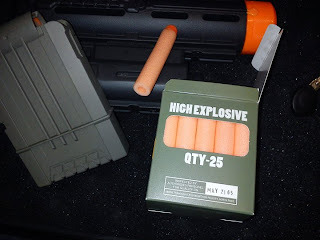 Alas there's no way I could get my hands on such cool airsoft stuff to cull and use in Australia to replicate it, but it gives me muchas ideas... the full post and details available here. Lazer Tag Phoenix LTX repaints.. cos they need them. 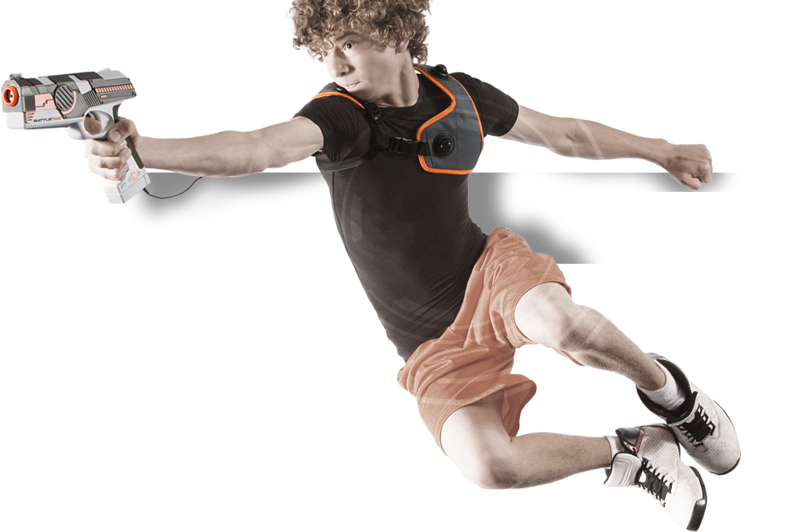 Lately I've taken a break from foam blasters and gone back to my tried and true love of Laser Tag. 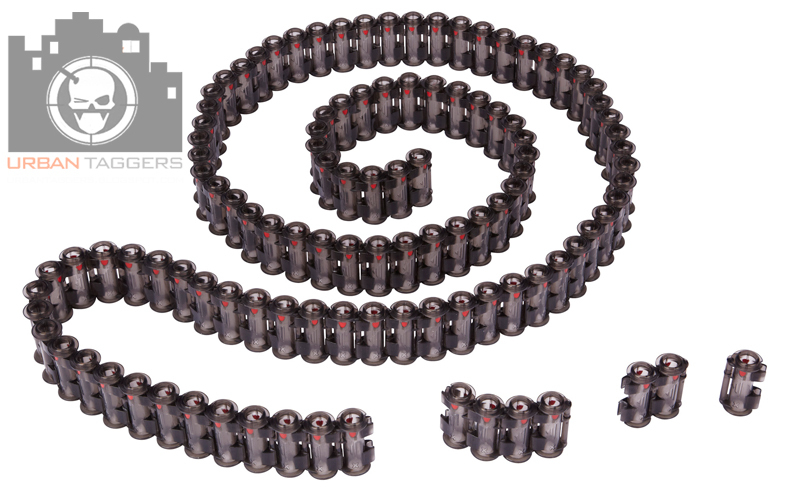 While I totally love my Lazer Tag Phoenix LTX's, the issue is they're pretty damn ugly. They come in a pretty poxy aqua light blue, or baby poo gold, neither of which are that nice to look at. Although I'm not much of a handy man, I've really been considering doing a repaint of them; something like this, which I found from the Omaha Laser Challenge forums. Be interested to know if anyone else has painted theirs.. any pointers welcome! 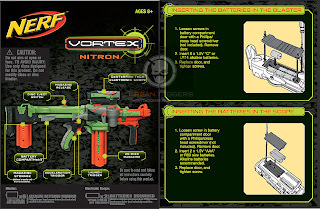 The original colour schemes of the LTX's. not priddy. 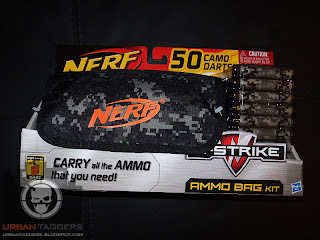 Soo.. no doubt there'll be the standard whingers who go on about "what's the point of camo ammo" and how useless they are in outdoor wars. And there'll be those of you who will say "meh I got these AGES ago.." etc etc. 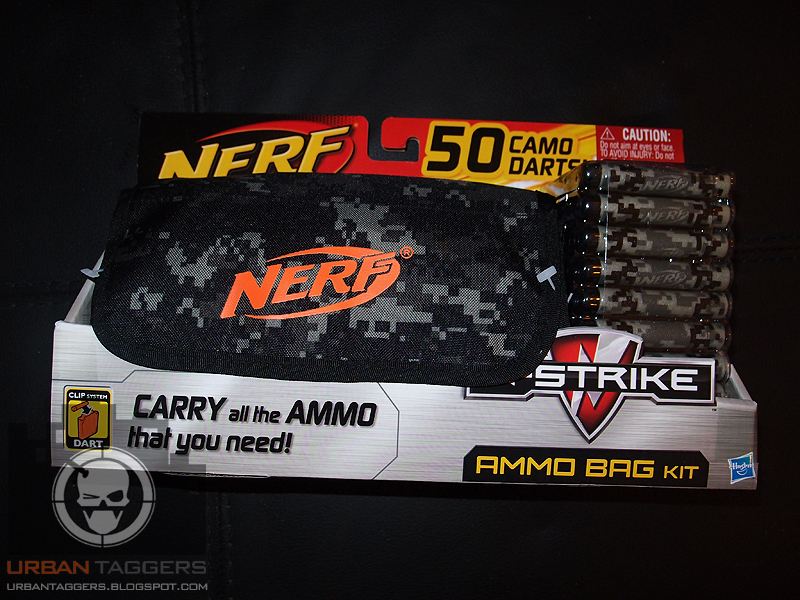 But as far as Nerf is concerned, I'm 1) a completionist, and 2) an aesthetic and these darts hit the sweet spot for both. 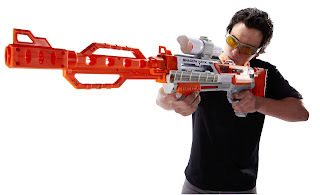 YouTube - Nerf Vortex- we're getting more detailed..
Nerf's official introduction to the new Vortex line in their new vid featured on their Facebook page Nerf Nation. Here it is for those of you who don't like believing rumours and sneak previews and only like things from official sources. It shows the blasters and their official names in "360 degree" views, complete with a tuff military style drum beat soundtrack. Hoo Rarrr! 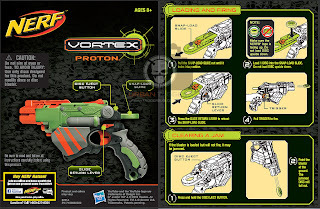 The Proton. Looks priddy. Mechanism revealed! 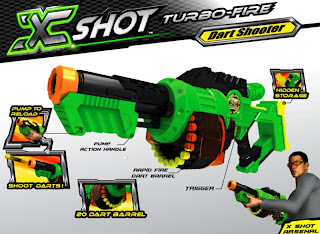 Battle Tag will make u, jump.. jump..
For those of you who've been visiting the All Brands Toys website, you may have noticed in the X-Shot blaster line there's also a new product called an "X-Shot Fire Ball". Just some intel thanks to loyal reader P13c30fch33s3: the new line of X-Shot blasters from Zuru are starting to pop up and are looking pretty interesting. Alongside the new revised Sidewinder that shoots darts AND discs, there's also a new 'Duel' that looks like a single shot blaster; there's also a "Turbofire" that looks to be a Raider style blaster, with a 20 dart capacity. It's pretty hard to be original these days. 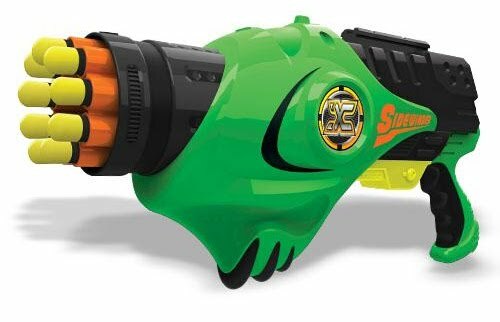 X Shot Blasters are the new kid on the block; the first series of blasters boasted both foam dart and water functionality which we thought was the unique selling point of the line to separate it from other brands. 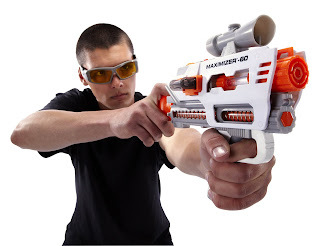 Arguably it was the Sidewinder that was supposed to be the most unique of the lineup; however it looks like it's been updated to do away with the water functionality and swapped it for an all new innovative.. disc shooting one..
Now I'm all for predicting trends, but you've gotta wonder how it was that the good peeps at X-Shot came up with the idea to do that? What possibly made them out of the blue think "hey.. lets update our blaster with a DISC shooter..just for funsies.."
It doesn't sound particularly orginal now, does it? Rumours: More on the white N-Strike variants..
Lanard Scatterblast: GRENADE!!! Well.. sort of. 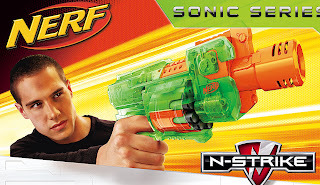 Thor Hammer: It's like N-Force.. but not.